is too funny… and fun to play with! Get your model from Yagakoro’s Deviant Art page. 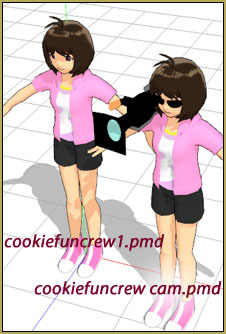 Stupidly fun, This “model” download contains several models and a few VMD files to pose them/drive them. 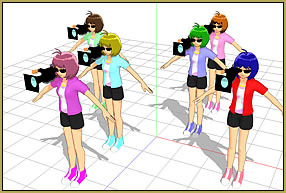 There’s a “six” model and a “twelve” model… in matching outfits or in rainbow outfits, as pictured. They all move as one… raise the right arm, and all the girls raise their right arm. But, each figure in the set has her own MotherBone, so you can slide her out of formation, or even off-stage, if you wanted to. The included VMD files snap the pose so as to make the models hold the camera… and, I forget which VMD, causes them to have slight motions as they stand still, focused on their target. 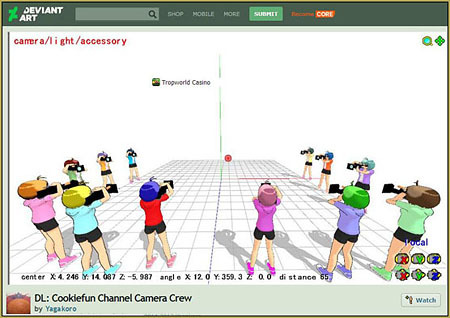 That Under Cam vmd makes the cameragirls squat down and aim their cameras up towards the sky. Note that ALL of those VMDs assume the girls are at a lower level than the stage. 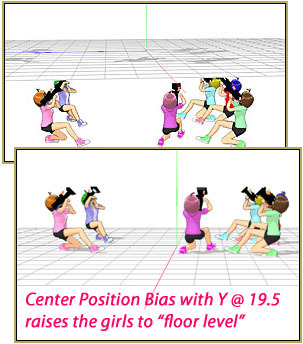 if you want them on the same plane as your dance model, you will need to use Center Position Bias with a positive Y value to lift them up. More models, we want more! A couple of the models are included as “singles” and can be posed individually. “Love casual” and I find the model is actually named Hidaka Love Casual. As you can see, there… she has MANY facial sliders… only four mouth/lip-sync options… but a TON of fun option sliders. This is a Japanese model. 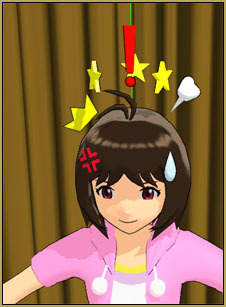 You will have to Translate her into English if you want to see the bone and slider names. 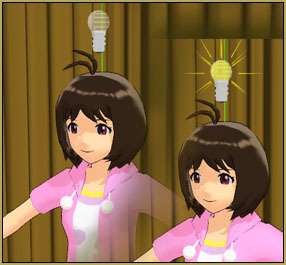 Like THAT one slider that puts the light bulb over her head, “Flash 1”, and then another slider, “Flash 2”, to “light” the light… what a great idea! You could make the light seem to blink, dink-dink-dink-dink-dink, when she gets an idea… too funny! and I think there’s a little breast-bouncing in there, too. I like her… she looks so anime normal.